Many tourists are aware that Yorkshire boasts lively cities, idyllic countryside, stunning architecture and breathtaking World Heritage Sites. Fewer know that the region is also home to the World Carrot Museum – www.carrotmuseum.co.uk – the first port of call for root vegetable enthusiasts across the globe. For more than a decade, curator John Stolarczyk, 56, of Cross Hills, near Skipton, has developed a museum website devoted to the carrot. Internet surfers of all ages have benefited from the retired Bradford Council officer's hours of painstaking carrot-related research, and today his work will be on display at Harlow Carr, near Harrogate. Visitors to the Royal Horticultural Society garden will see just how passionate Mr Stolarczyk is about carrots, something his wife Sharron and daughter Elizabeth witness all year round. "I would say my family tolerate me. My wife works part-time as an archaeologist and my daughter's at university so I'm pretty free and easy to pursue the carrot hobby. "I'm going to bring about 200 carrot-related items to Harlow Carr with me, and I'll be wearing a carrot costume I bought for £20 on eBay," he said. Mr Stolarczyk's daughter Elizabeth might feel partly responsible for her father's obsession – the carrot museum was her idea in the first place. "My daughter said 'I'm sure there's a museum for just about everything, but I bet there isn't one about carrots'. That was the bingo moment for me; I searched around, went to libraries and built up my knowledge about carrots. Once it got going, people wrote to me. "A lot of them live in the US, but they're all over the world. 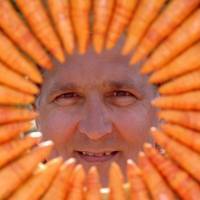 There are even some people in Australia who make musical instruments out of carrots,"
Mr Stolarczyk said. The website, started in 1996, includes a history of carrots, references to carrots in literary works, and even an essay on theories that the vegetable has "contraceptive properties". Dozens of carrot-themed collectables are profiled, ranging from candles and clocks to forks and fishing lure. Mr Stolarczyk said: "There was only one thing that I wasn't able to find. None of the collectors had a corkscrew, so I commissioned one. I had 20 made and most of them have gone to my carrot friends." In February this year, Mr Stolarczyk attended a week-long carrot festival at Holtville in California, billed as the 'Carrot Capital of the World'. He visited a carrot festival in Canada last year and is planning trips to Switzerland, Turkey and New Zealand so he can meet more enthusiasts. He went to a Ukrainian village two years ago to track down a long-lost uncle, only to find he had been a carrot farmer all his life. "It's in the blood." The World Carrot Museum will be at Harlow Carr today from 9.30am to 4pm. It is one of a host of attractions during the garden's Family Fortnight, which runs until August 24.